Irvine. 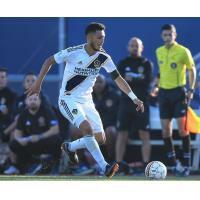 Calif. - Orange County SC announced today the addition of Hugo Arellano on loan from LA Galaxy for the USL Championship 2019 season, pending league and federation approval. "Hugo is a player that I'm very familiar with from his time in the Galaxy academy," said OCSC Head Coach, Braeden Cloutier. "He has a lot of experience for such a young player and is a very good defender that can play both central or as a left back. I feel he is a great fit for how we like to play." Arellano, 21 made his MLS debut for LA Galaxy against Houston Dynamo in 2017 and went on to make 3 more appearances that season. During his time with the Galaxy he has represented their USL Championship affiliate side LA Galaxy II, making 40 appearances for Los Dos. "I'm very excited and eager to be joining the Orange County Soccer Club," said Arellano. "I believe it was in my best interest to join a club where the team has such a desire to win. The club had a very successful run last season and I plan on contributing right away, to get us even further than last year." The SoCal native has also been ever present in the U.S. youth national teams from U-15s through to the U-20s. He played a key role in the 2015 FIFA U-17 World Cup, when he captained started in all three matches for the U.S. His most recent appearance for the national team was in 2016 when he started against Costa Rica for the U.S. U-20s. "We are thrilled to add Hugo to our talented roster for the season," said Oliver Wyss OCSC General Manager. "I want to thank the LA Galaxy for providing us a versatile defender that will definitely show his class and have a big impact in Orange County!" Arellano joins his former LA Galaxy teammate, Leonardo who signed with Orange County SC earlier this week, both arrive in time for the club's USL Championship home opener on March 16th against Tulsa Roughnecks.